Spring-like weather is in the area and it’s only going to get better, which means just one thing: It’s time to plan an all-girls vacation. Many times women of all ages visiting Edisto ask the same questions over and over again, so we will address those questions here. Let’s begin with the all-important day spa. Edisto does not offer a typical day spa, but Edisto Creations Hair and Day Spa offers all the beauty rituals that women expect. Edisto Creations offers full hair services, body waxing, manicures, pedicures, massages, and more. However, because Edisto is so uniquely small, the staff at Edisto Creations is also small, so ladies looking to sit side by side while getting their beautification rituals on might have to do a little planning to make sure they can be seen at the same time. So, unlike day spas in larger cities where groups can sign up for a day of beauty, a little schedule juggling is necessary on Edisto, but it’s definitely worth it. Contact Edisto Creations at 843-869-4247. Shopping is another fun part of a girls’ getaway. Edisto offers a variety of gift shops, beach gear and clothing stores, and art galleries. It’s also less than an hour away from Charleston, which is loaded with shopping options including malls, indoor/outdoor markets featuring handmade items, art galleries, tourist shops, high-end clothing stores and boutiques, and virtually anything else a girl would ever want. Shopping downtown Charleston on King Street is definitely something everyone should experience because it blends beauty, history, and shopping all into one. Charleston also offers a variety of activities that visitors enjoy such as the horse-drawn carriage rides, tours through the historic Battery, tours of historic plantations and grounds, world-class dining, harbor tours, night clubs, theaters, concert venues, and so much more. Now back to Edisto. Many people plan trips to Edisto and have all these ideas to go off and see the beautiful sites in the area, but then find themselves intoxicated by the beach itself and never leave. That’s because there’s nothing that can compare to Edisto. Whether it’s the beach itself with its miles of sand and shells, walking trails through town and in the woods, sitting on the porch with a cold glass of sweet tea, or visiting one of the many restaurants in the area, whatever visitors choose to do finds a way of becoming a perfect day on Edisto. The best part is that Edisto’s slow pace and lack of crowds makes every visitor feel like their vacation was tailor-made just for them. If you’re ready to get away with the girls and come to Edisto, check out the vacation home rentals on this site and find your dream rental home. Visitors can stay in homes that fit almost any budget from new constructions on the beach with private pools to snuggly cottages with wrap-around porches. 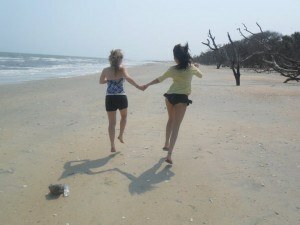 But remember wherever you stay, any trip to Edisto provides ample relaxation and makes a million memories.